Not a lot to do in Dzoraget but with a kitty like this what more do you need? From Tbilisi we drove nearly three hours south across into Armenia. The plan was to break up the drive to Yerevan and there was supposed to be a nice hotel almost exactly in the middle between the two capitals. 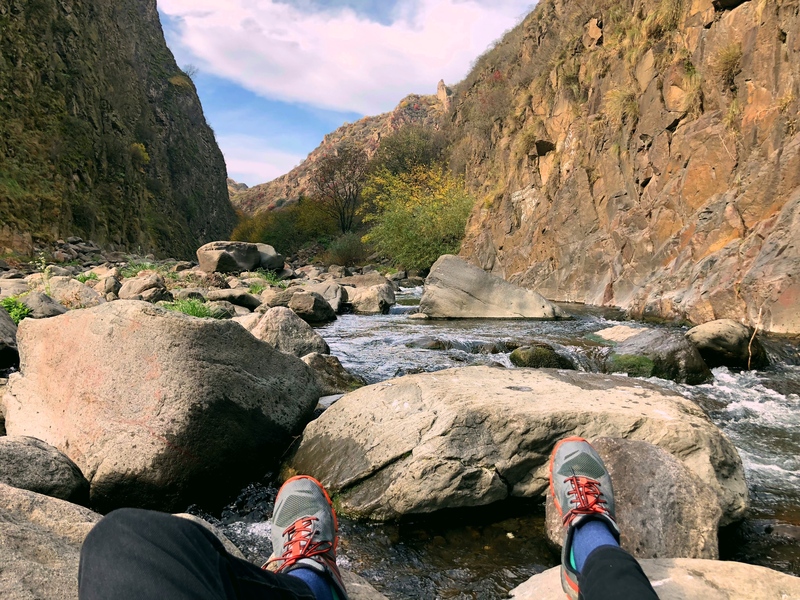 The hotel is right on a little river in the Debed Canyon so it seemed perfect for a couple nights, a little hiking, whatever. Well, it didn’t quite work as well as we’d hoped. The hotel was nice enough and the setting in the canyon was beautiful. But there was nothing to do. Nothing. No hiking trails, no little town, no alternative restaurants. Nothing. If we’d had a car you could drive to some World Heritage-listed monasteries, but we didn’t so there was not a lot to do. Which made two days a bit long. 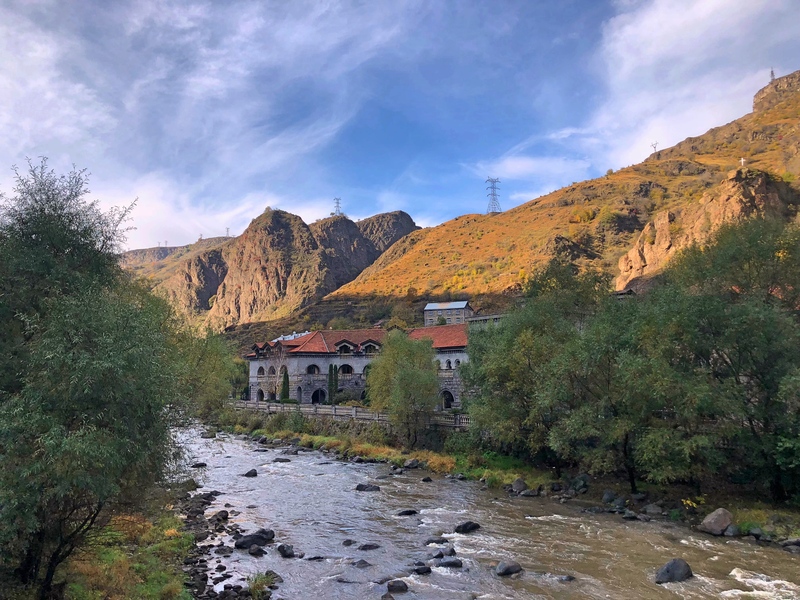 The Avan Dzoraget Hotel nestled along the Debed River. A beautiful setting but definitely on the dull side. There were still some little gems to be experienced. Mark had a cat that loved sitting in his lap getting petted. One day it was sunny enough for me to find a rock in the little stream and read. The food at the hotel was excellent which was surprising. Both days we were there a bus with tourists would pull in around 4:00 PM and they’d have a dinner table set for 25 or so; otherwise we were the only guests. That’s not typically the environment for great food but the food there really was great. Ultimately I enjoyed our two days. If I have some beautiful scenery and a place to read I can be happy. Mark? Bored out of his mind. That’s OK, from here it’s down to Yerevan and the city will keep him engaged. 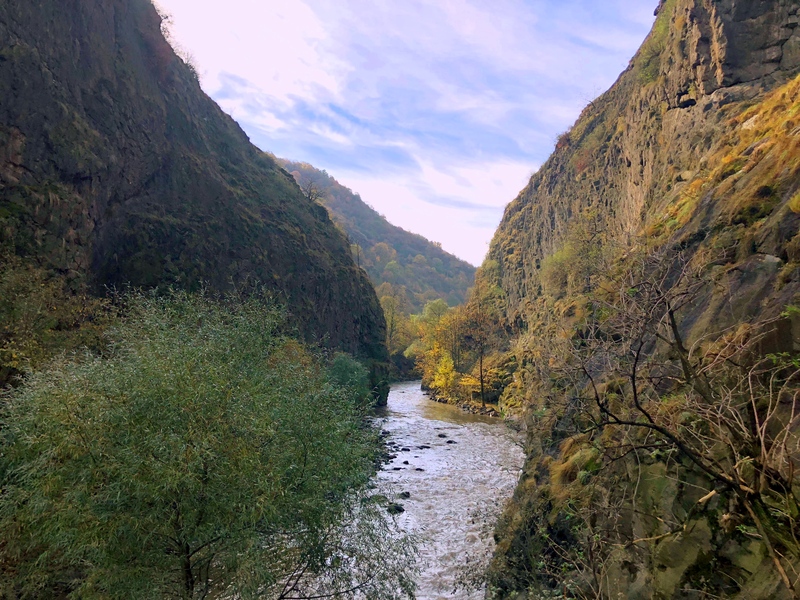 A rock, the little Dzoraget River, a valley, and a book. What more do you need? Looking up the Debed River no more than a quarter-mile from our hotel. Would have been a great place to explore but there were no trails at all. The food here was really, really good, everything super fresh. 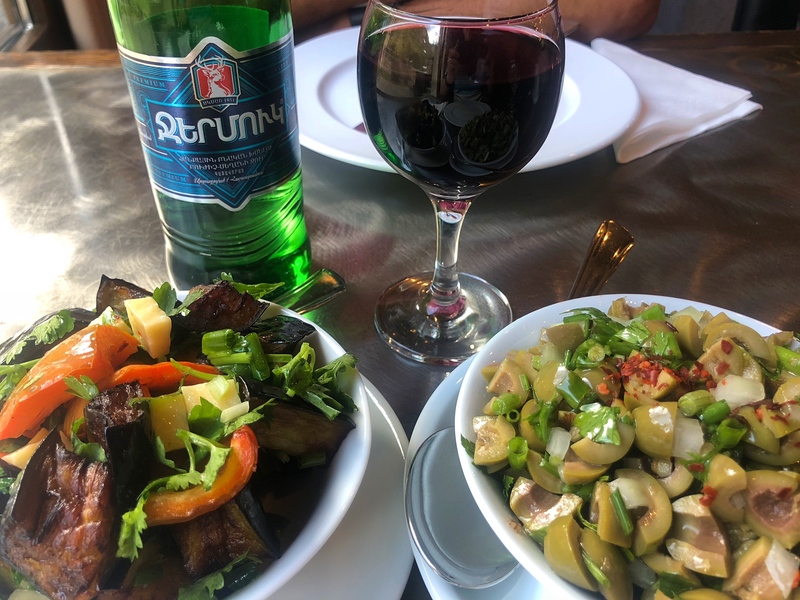 Here we have a grilled eggplant salad, an olive salad, and a nice glass of Armenian wine. So much better than that over-hyped Georgian wine! Somehow I always seem to stumble onto cemeteries. As I noticed in Georgia most headstones have photos of the deceased somehow impressed on the stone. Eerie. 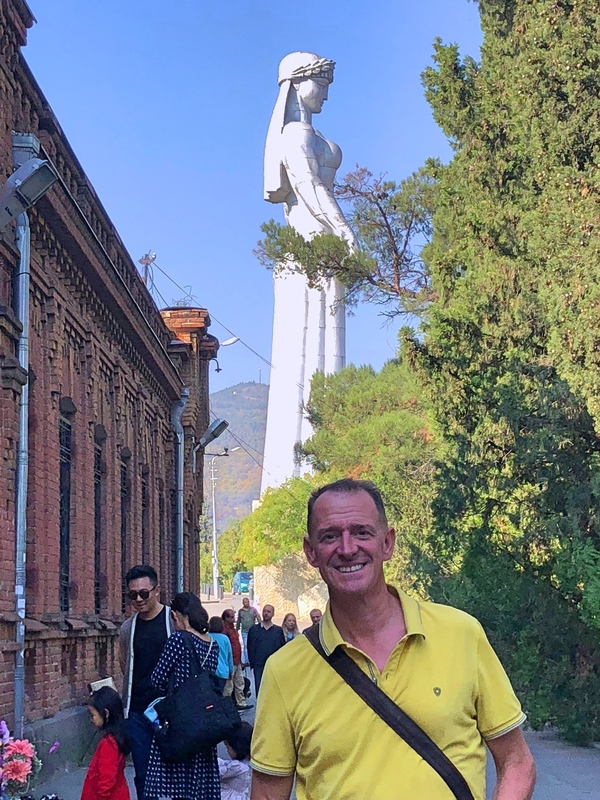 I was looking forward to Tbilisi, a historic capital wedged between the Russian, Persian, and Ottoman empires. It’s a place I have long wanted to visit and it definitely lived up to and even exceeded my hopes. 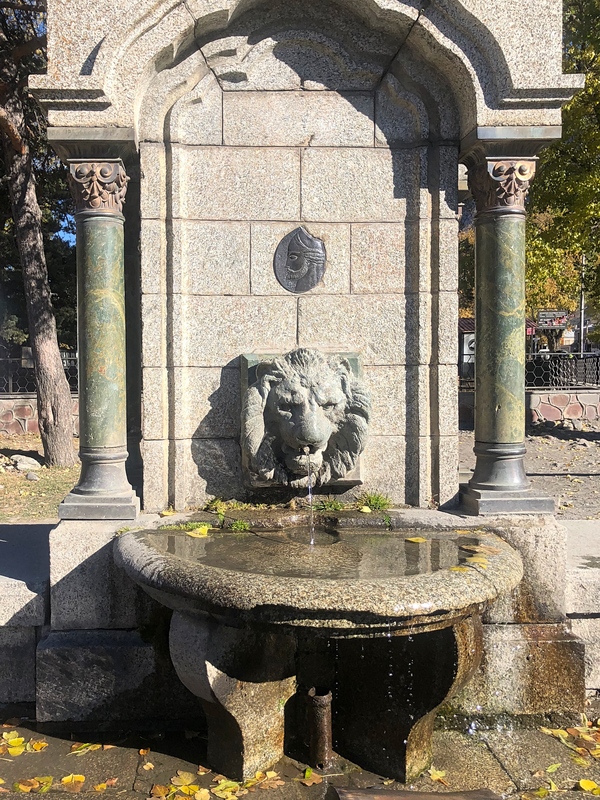 It’s hard to say that there is anything specifically great about Tbilisi (known typically as Tiflis until 1936) except that it just has a great feel to it. Because of its location at the crossroads between east and west it has always been something of a cosmopolitan city, something evidenced by the wide range of architecture. And the fact that the weather was just about perfect – sunny with low humidity and highs in the upper 60s – didn’t hurt. This thing about travel during the shoulder seasons can work really well. We stayed at the Rooms Hotel Tbilisi, sister hotel to the place we stayed in Kazbegi. 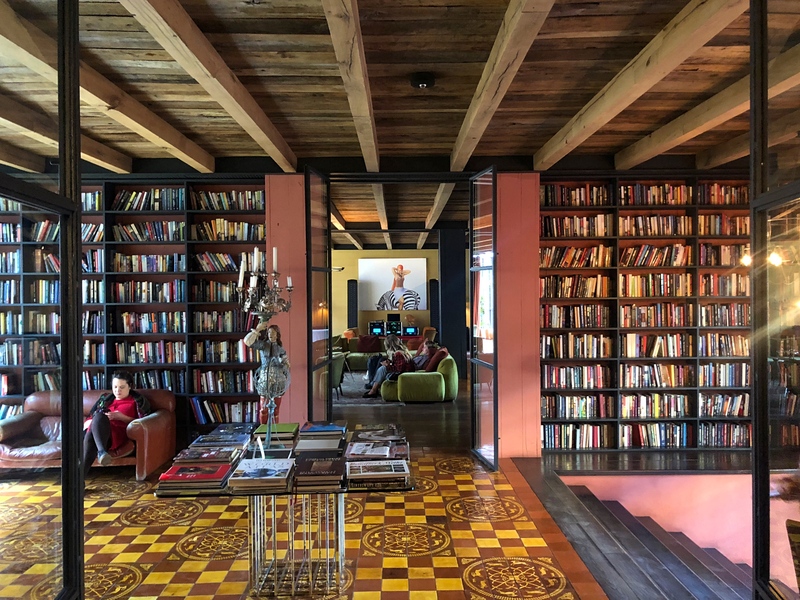 I think these are the only two hotels they’ve done but it’s an absolutely great model turning old buildings into lively and exciting spaces. 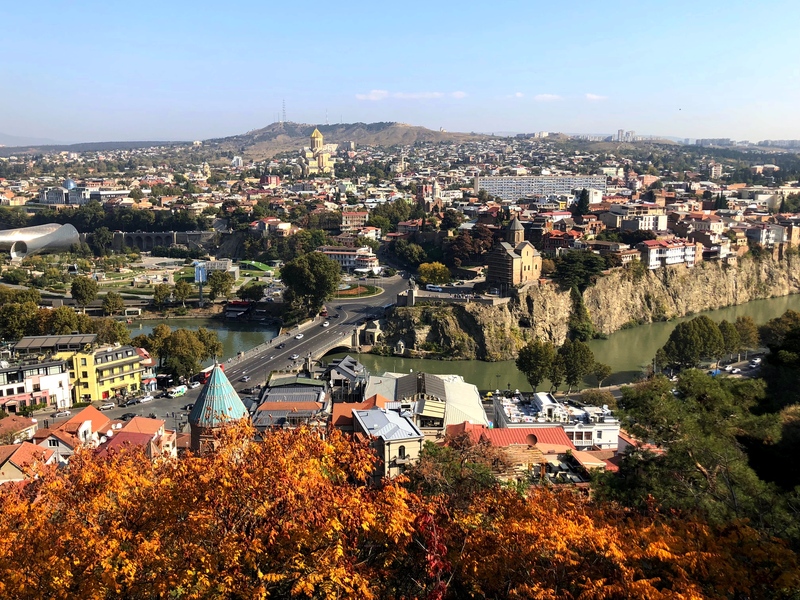 What is there to do in Tbilisi? You can walk around a lot. The old city is small but definitely worth a visit or two with some good restaurants packed in. The Bridge of Peace over the Kura River is a particularly beautiful walkway. You can take a cable car from right near the Bridge of Peace up to the 65-foot Mother of Georgia statue, erected in 1958 to celebrate Georgia’s 1,500th anniversary. 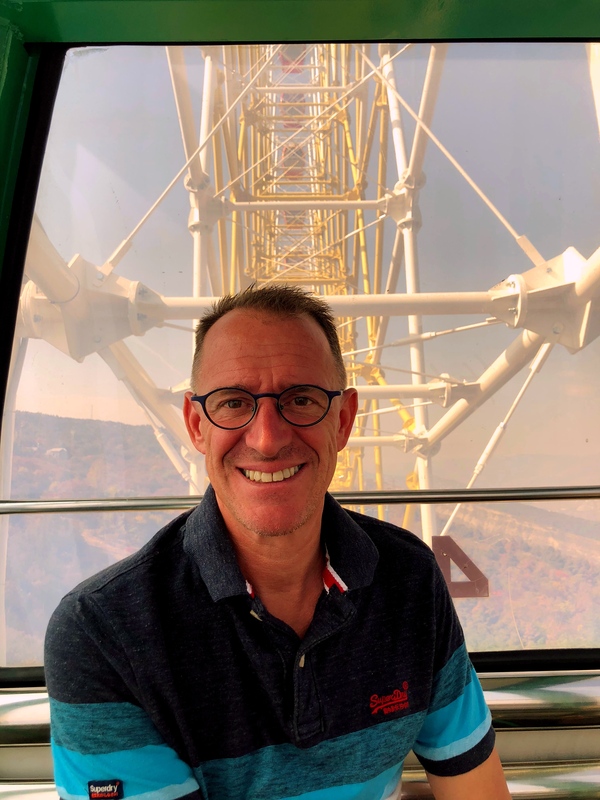 Or you can ride a funicular up to Mtatsminda Park, home of a 200-foot high ferris wheel with great views of the city. One surprise was the Zurab Tsereteli Museum of Modern Art. I wandered in one afternoon after lunch and a pleasant hour or two reading in a park, not expecting much. Instead it was one of those serendipitous moments when you learn something truly interesting. Zurab Tsereteli, you see, is Georgia’s most prominent modern artist and, since 1997, President of the Russian Academy of Arts. 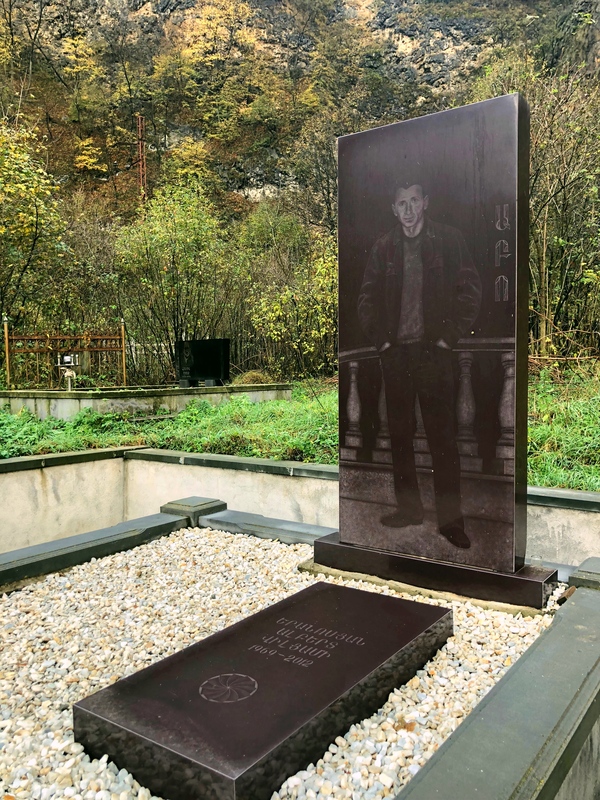 We’ve actually seen two of his more famous pieces in Moscow, a decidedly controversial statue of Peter the Great – occasionally voted one of the ugliest statues in the world – and the somewhat more conventional Cathedral of Christ the Savior. 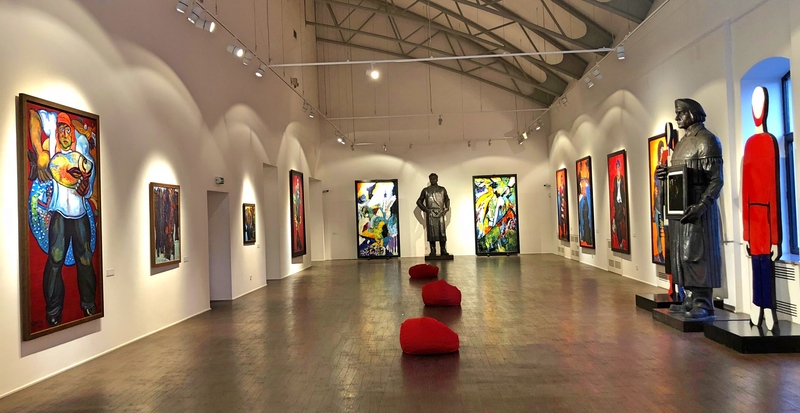 The current exhibit in Tbilisi’s Museum of Modern Art is a collection of recent work, large oil paintings from the last 10 to 15 years mixed in with some large statues he’s done over the years. It’s a remarkable body of work for someone who would have been in his late 70s and early 80s when he created them. 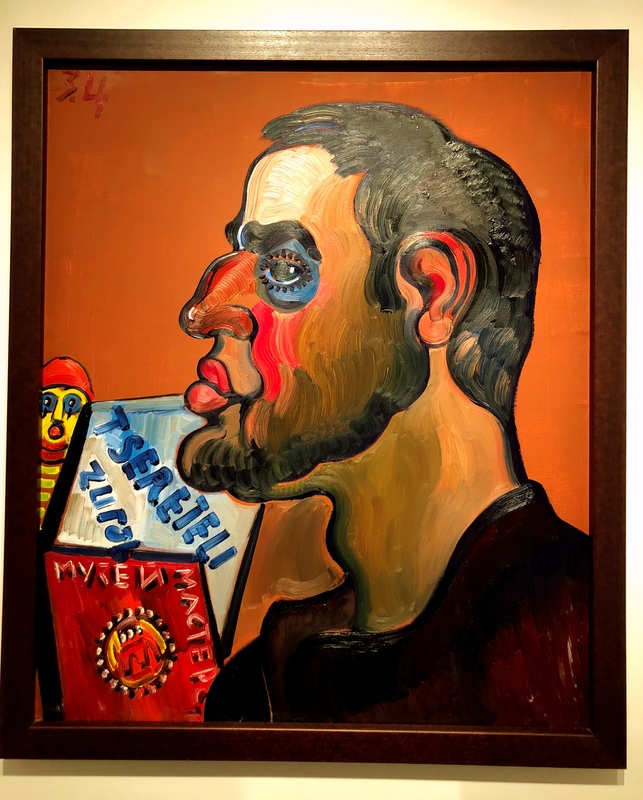 It was fun to learn about this giant in Georgian and Russian art, though I would try to forget that he’s a big friend of and apologist for Vladimir Putin. Tsereteli’s Dima with Tonic and Gin. 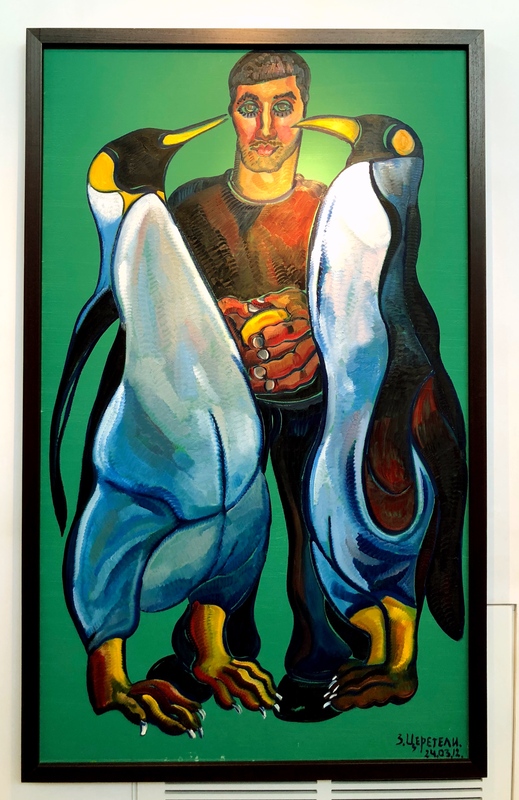 I can’t say exactly what that title means but I like the painting. 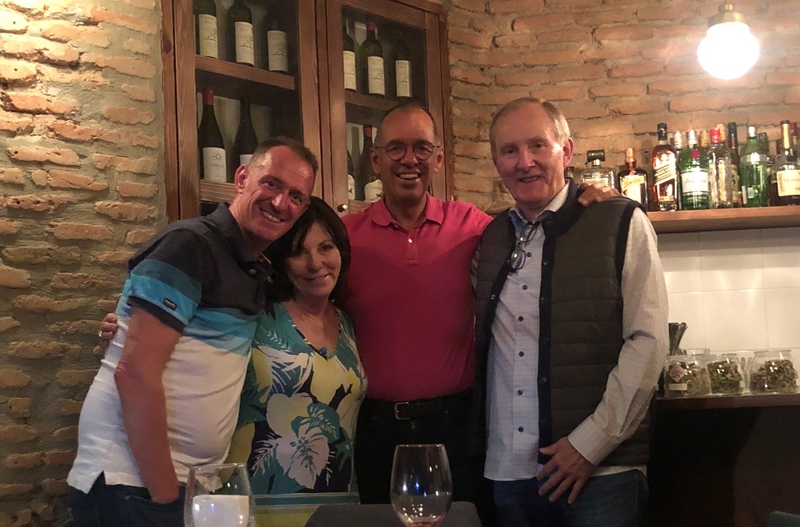 And then the other big event for us was an evening with Patty and Chaz, a couple from St. Louis we met and enjoyed drinking with in the Maldives. Just before we pulled into Kazbegi a few days ago I saw on Facebook that they were leaving Kazbegi. 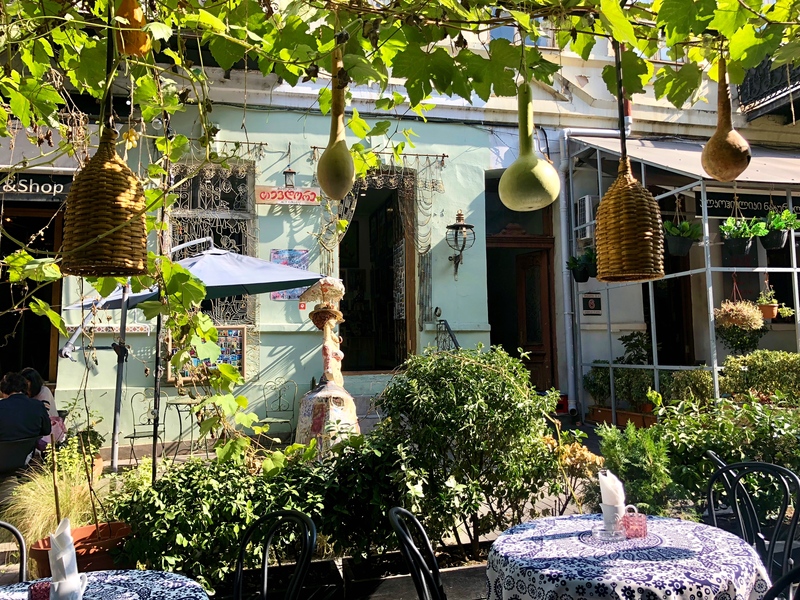 I messaged Patty to ask if we had just missed them and we discovered that we would cross paths for one night in Tbilisi, so we made plans to have dinner. 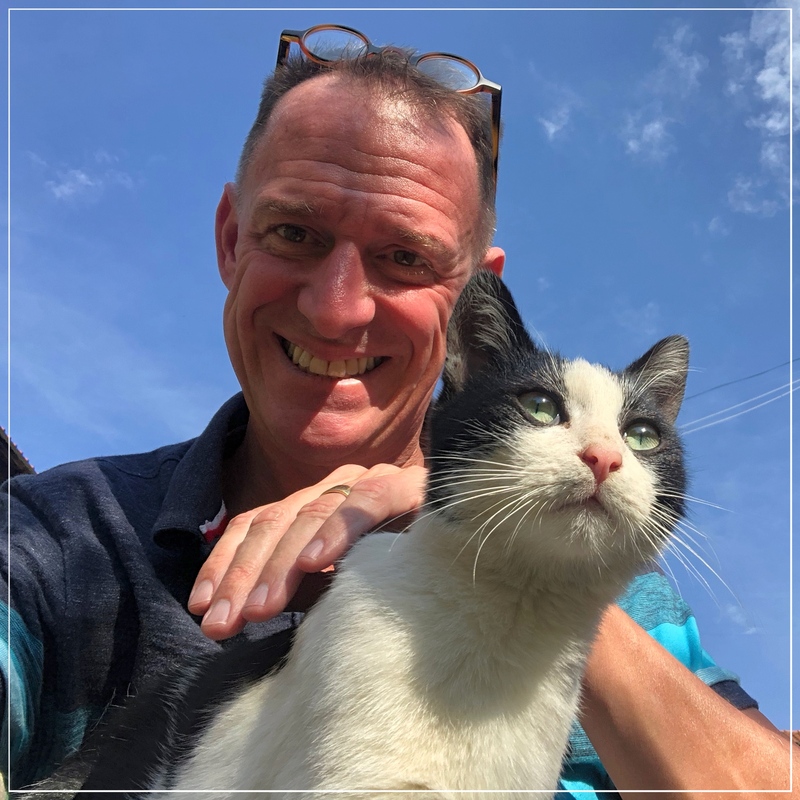 It’s one thing we enjoy a lot on this adventure is meeting friends – sometimes old friends, sometimes intrepid travelers we’ve met along the way – in obscure places. I’ll call Georgia obscure enough to qualify. A fun evening with Patty & Chaz. Officially they live in St. Louis but they seem to be on the road almost as much as we are, and just as likely to be in some pretty obscure place. Last time Maldives this time Tbilisi. I’ve suggested we do the next meeting in Zanzibar. This is our last stop in Georgia; from here we head down to Armenia for six nights. One word, though, about Georgian wine. For years, particularly in recent years as I’ve read Russian and Soviet history, I’ve read about these great Georgian wines. Over and over you hear how surprisingly good they are and I was looking forward to trying them. Surprising, yes. Good, not so much. Perhaps they were good in comparison to what else you could get in the Soviet Union in the 1940s or 1960s, but Mark’s estimation was that they ran from tolerable to terrible. I probably wasn’t quite that negative but I would say that the gap between reputation and execution was perhaps the biggest I’ve ever experienced. Let’s just say I won’t be hunting out the Georgian Wine section in Manhattan liquor stores when we settle there in a few months. 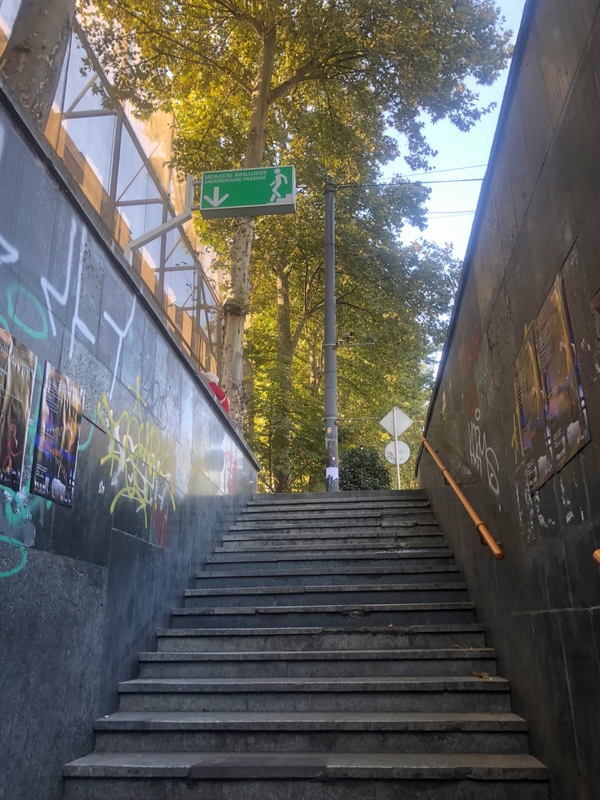 One feature of the former Soviet Union that I’m always amused by are these underground passageways to cross major streets. I mean, you certainly wouldn’t want to interfere with vehicular traffic, after all. One you get down there there are all sorts of little shops and people selling stuff and, often, bad musicians. A funky little restaurant in the old city where we had a frustrating meal, one of those places that after you wait and wait for food the waiter says “It will be here in five minutes” and fifteen minutes later you’re still waiting. The setting was nice though. 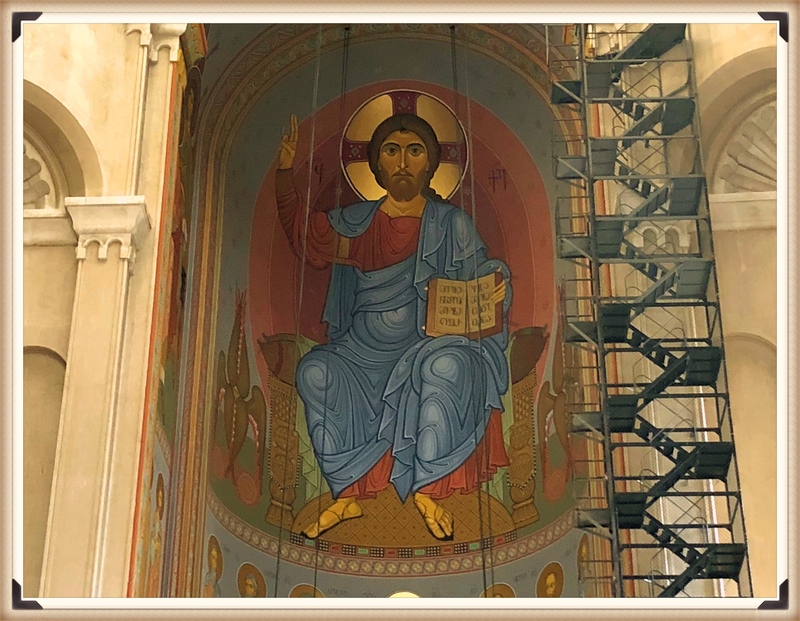 Christ sitting in the dome of the new Holy Trinity Cathedral, consecrated in 2004. The main cathedral of the Georgian Orthodox Church, this is pretty much the only finished space; the vast majority of the interior remains to be painted. I guess we’ll come back in 10 years or so to see how they’re doing. 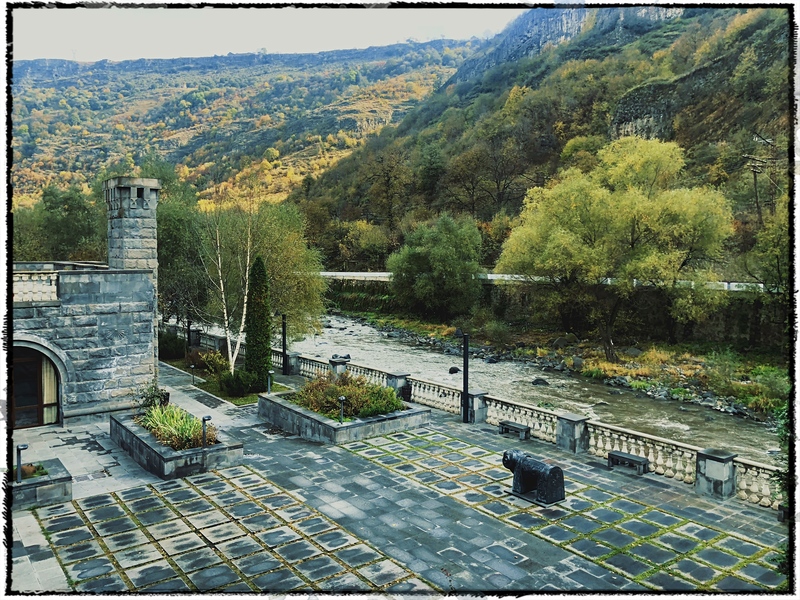 And finally a view of a little bit of Tbilisi and the Kura River across to the Holy Trinity Cathedral from up near the Narikala Fortress. Fall really is beautiful here. The view from the Rooms Hotel terrace. 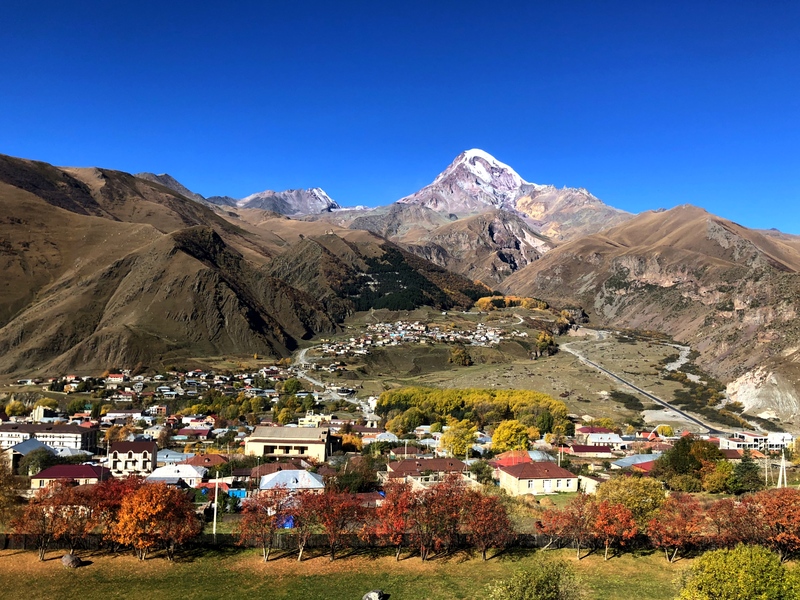 That’s Mount Kazbek covered in snow with the town of Kazbegi in front and the even smaller town of Gergeti across the river. Here we are now, finally high up in the Caucasus. These are serious mountains so a great place to celebrate my 63rd birthday and our 31st anniversary. Well, not quite perfect. Mark, you see, was sick. Presumably something he ate during our stay in Sighnagi, probably the lunch in Telavi. Which doesn’t exactly make sense, as this region is the kind of place where you share dishes and I ate everything he did. However it happened, he was sick as a dog on the nearly five-hour drive up here, sick on my birthday, and sick on our anniversary. Not exactly ideal. Still, it was a memorable and genuinely beautiful stop. There were three highlights from my perspective: Mt. 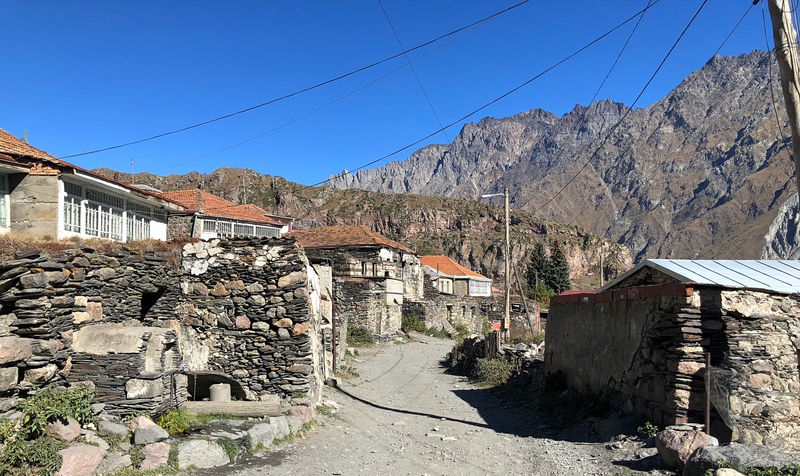 Kazbek, the Gergeti Trinity Church high above the town, and a wonderful hotel. First, though, a word about the name. Technically the town is called Stepantsminda, or St. Stephan’s, named for a monk who founded a hermitage here long, long ago. 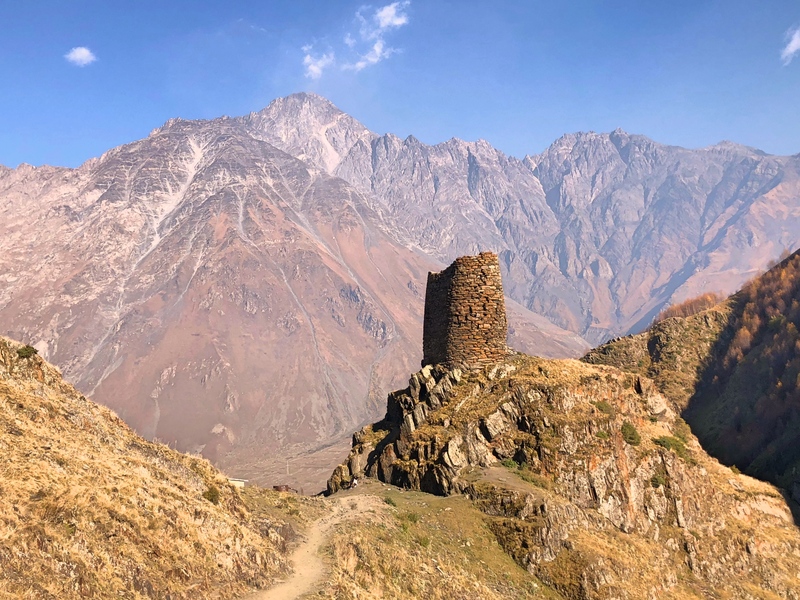 Starting in the early 19th century though the town started to be known as Kazbegi, the surname of the local lord who was loyal to the encroaching Russians. The Soviets formally changed the name of the town to Kazbegi in 1925, but then the Georgians formally changed it back to Stepantsminda in 2006. 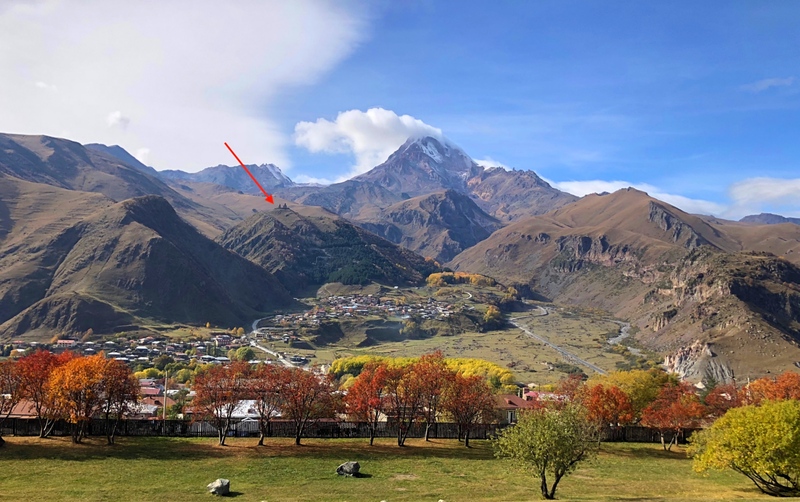 Notwithstanding that change to its historic roots, pretty much everyone, tourist and local alike, refers to it as Kazbegi. So that’s what we’re going with here. 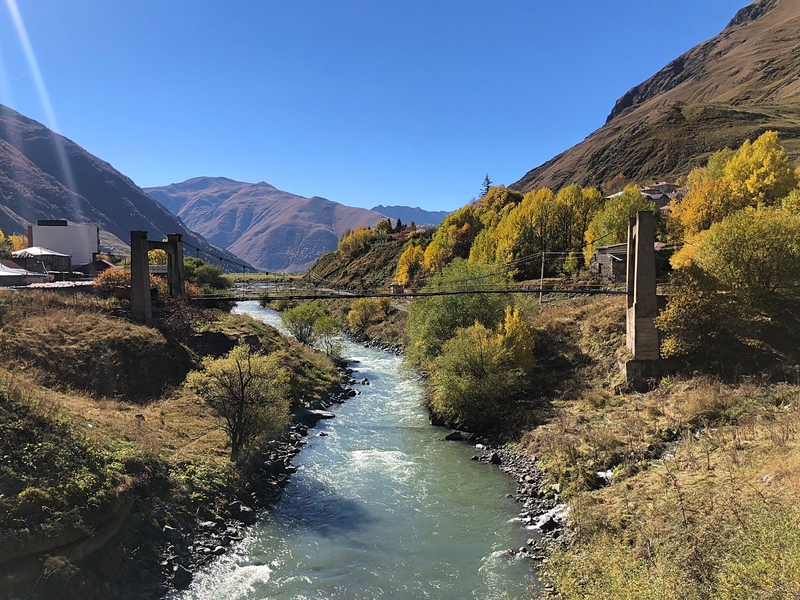 The old bridge over the Terek River linking the little towns of Gergeti and Stepantsminda. Today it has been replaced by a very boring modern bridge, but thankfully they left this standing. Now, back to the highlights. 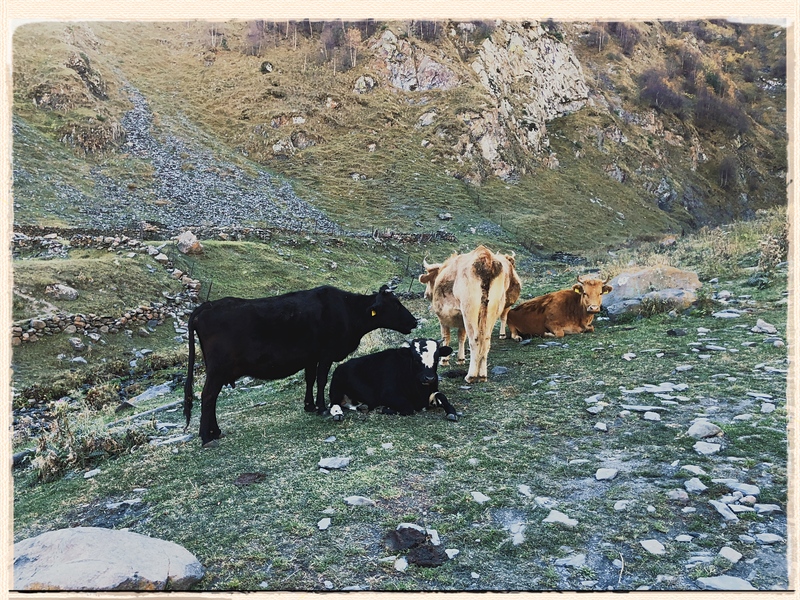 You really come to Kazbegi for one thing, to enjoy the mountains, and that we did. And to enjoy them properly, there is only one hotel to stay in, the Rooms Hotel Kazbegi. The hotel is an old Soviet-era tourist hotel so in theory you shouldn’t expect much; they weren’t exactly known for style and class. The owners, though, did a fabulous job creating this chic, happening, buzzy space that you can’t help but fall in love with. The lobby is massive, but rather than just being a big open space there are innumerable little spaces for sitting, relaxing, reading, chatting, eating, drinking … whatever. And those spaces are always occupied. Best of all, though, is the enormous outdoor terrace, chock full of couches and chairs, with stunning views of Mt. Kazbek. You can spend hours out there, again reading, chatting, drinking wine or whatever, with these great mountain views. And if it’s a little too chilly, particularly when the sun starts going down, they bring you blankets to wrap around yourself so you can enjoy it as long as possible. The rooms are as small as you would expect a Soviet tourist hotel to be, but who wants to spend time in the room when you have all those mountains to explore? And what about those mountains? 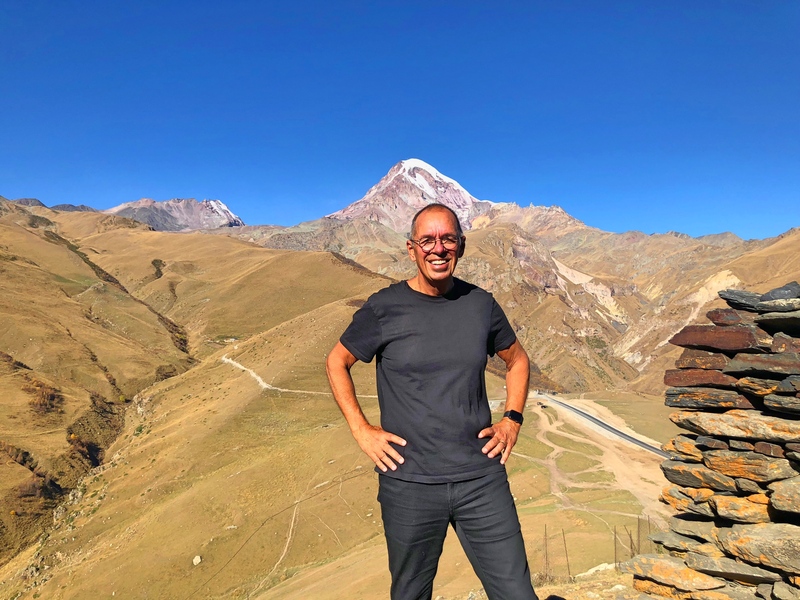 From the hotel you look across the Terek River valley to Mount Kazbek which, at nearly 16,600 feet, is one of the highest peaks in the Caucasus. To put that in perspective, the highest peak in the contiguous U.S. is Mount Whitney in California’s Sierra Nevada at 14,500 feet so, yeah, Mount Kazbek is high. 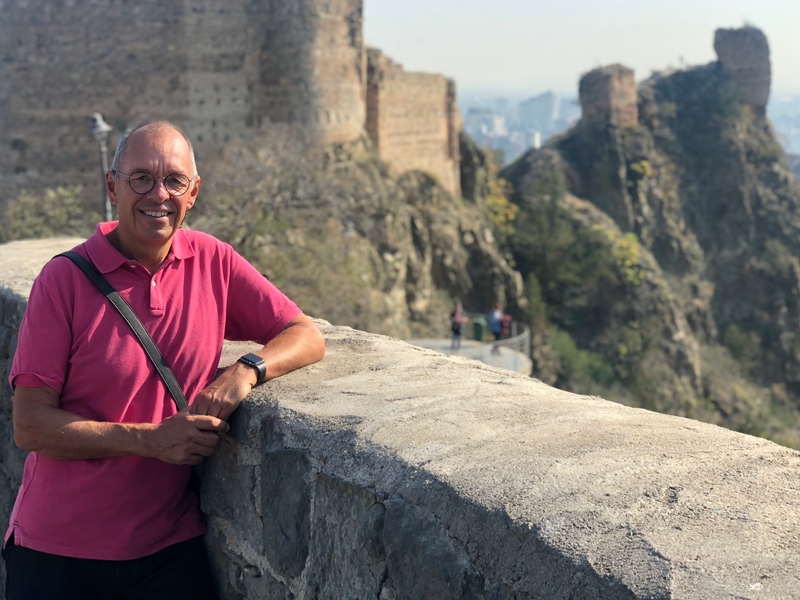 Important in history, too, since according to legend it was here on Mount Kazbek that Prometheus was chained to a rock as punishment for stealing fire from the Greek gods and giving it to humans; every day an eagle would come to eat his liver and every night it would grow back. Quite an unpleasant way to spend the ages but it worked out pretty well for the humans who finally had fire. Another shot of the view from our hotel highlighting Gergeti Trinity Church, the first goal for my hike. First you have to walk down into the town, then you hike up around the left side of that hill the church is on to approach it from the rear. 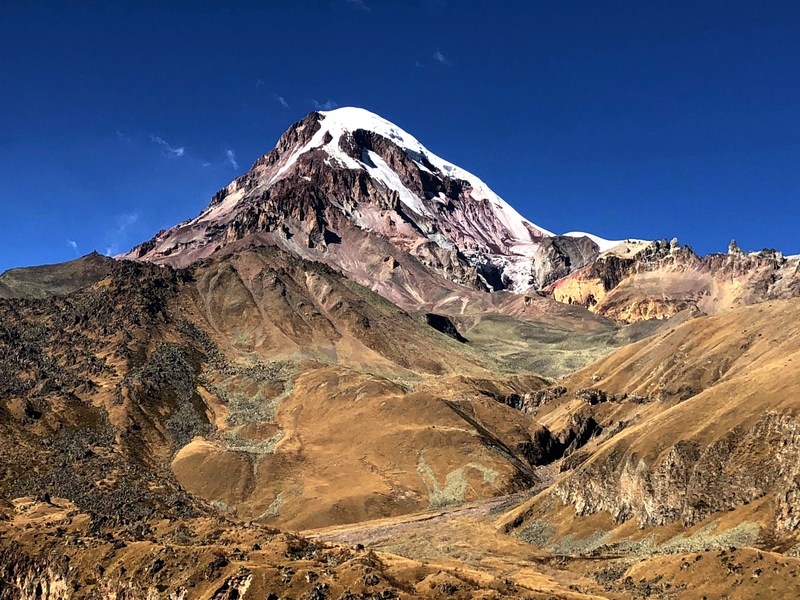 Then, if you’re really ambitious, the trail keeps going on and on an on, up into the mountains, closer and closer to Mount Kazbek itself. So that’s what I did. Alone, sadly, as Mark was still recovering, but it was still a stunning hike. Apparently the trail continues up into a glacier on the side of Kazbek but I didn’t make it that far. 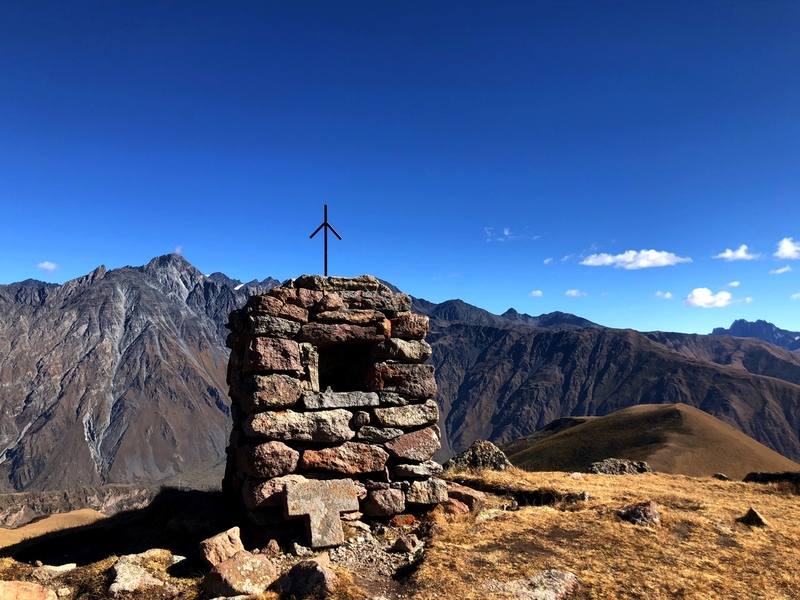 I hiked for a few hours, including a delightful lunch break to finish reading a history of the Caucasus I’d been working on, finally turning around when I’d reached 9,300 feet, Way, way above the valley where I’d started. And then was reminded, of course, that the descent can be almost as brutal on your legs as the climb. By the time I got back to our hotel I was beat. The view from near the end of my hike. On the left the arrow points to the church, which seemed so high when I started, while the arrow on the right points to the hotel where I started. One fun story about the descent. I was coming down a long, gradual slope and saw way in front of me what appeared to be two people, one on his or her knees. As I approached it became clear it was indeed two people but now they were both standing, hugging. And then I realized that he must have just proposed to her. As I got closer they turned toward me, a cute young couple both just grinning from ear to ear. Without asking I congratulated them, offered to take their picture, and then left them to their joy. So sweet! And that was Kazbegi. 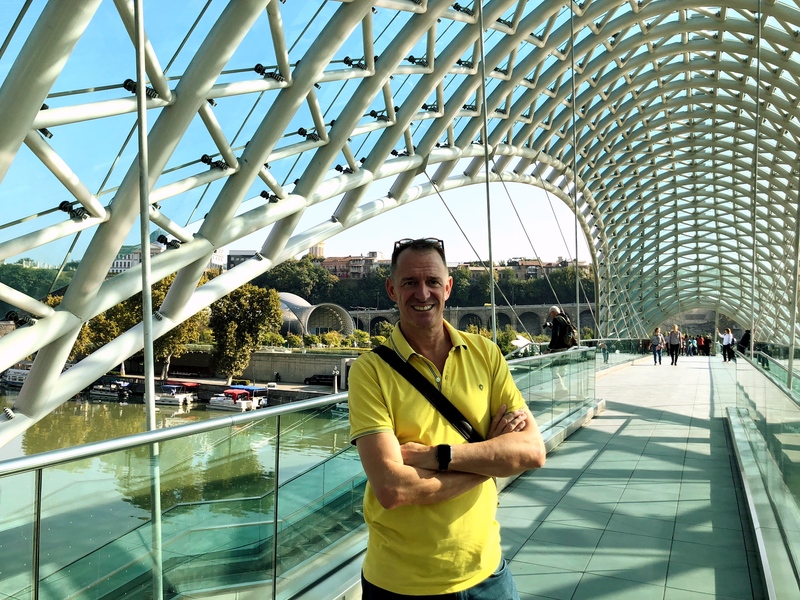 The next day I was a bit of a wreck – my Apple Watch said I’d climbed the equivalent of 305 flights of stairs, so I can be excused – and spent the day lounging in the comfy lobby chairs and then sitting out on the sunny terrace. Mark tried to tackle the climb to the church but was still weak from his stomach issues so he didn’t quite make it. 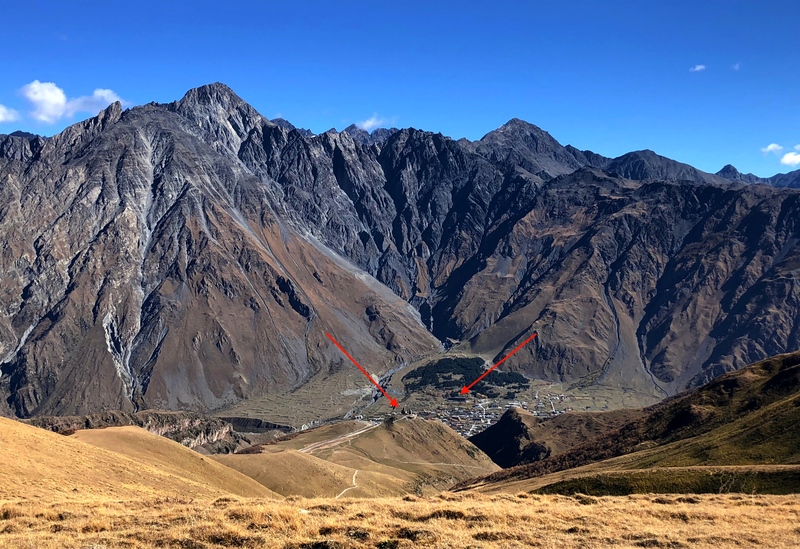 All in all, though, Kazbegi/Stepantsminda fully lived up to the hype we’d read about. I can’t be too confident I’ll ever get back, but it was one of those great places to see at least once. Here I am up at the Trinity Church, not yet sure if I was going to keep going. I did, along that ridge rising over my right shoulder, and loved the rest of the hike. This is up at about 9,000 feet elevation. 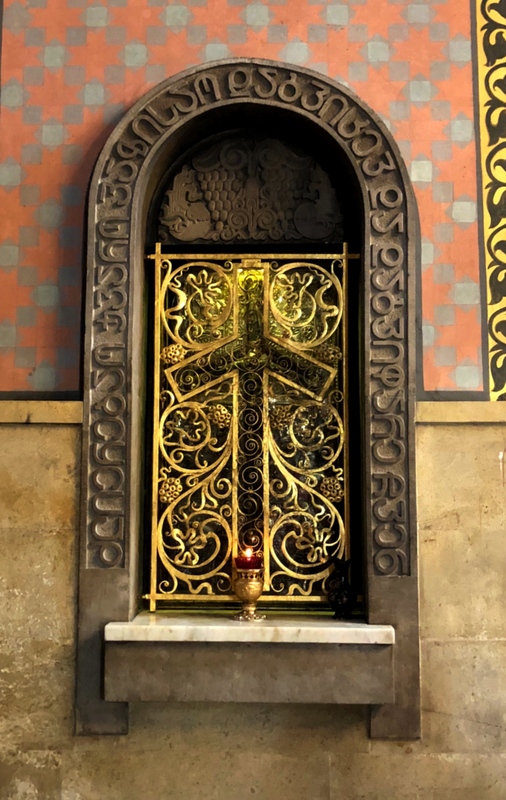 The oddly shaped cross is the classic Georgian grapevine cross, the symbol of the Georgian Orthodox church. Legend has it that St. Nino, a Cappadocian woman who came to Georgia to preach the gospel in the 4th century, received the cross made of grape vine from Mary herself and secured it by wrapping it in her hair. I’m not absolutely convinced that’s true, but it makes a good story.